'Let's Go Shopping! Victorian Consumer Culture' is theme in 2017-2018 for guided tours of Cape May's 1879 Emlen Physick Estate ~ The History Girl! New developments such as department stores, chain stores, mail order catalogues, and enticing advertising drove consumer culture during Victorian times in America. Department stores played a huge role. When John Wanamaker opened a new Philadelphia store in 1876, only a few dozen U.S. department stores existed. Some five decades later, over a thousand such stores were visited by a hundred thousand shoppers daily. By 1915, the expression "chain stores" had come into usage and chain grocery stores were evolving into "supermarkets." Mail order catalogues, such as those from Sears Roebuck and Montgomery Ward, reached millions of Americans in rural areas, while advertising for any company selling consumer goods became a necessity, as competition between purveyors was increasing daily. The Emlen Physick Estate is an 18-room mansion built in 1879, attributed to renowned architect Frank Furness. The Physick Estate is one of the finest examples of Victorian "Stick Style" architecture in America. Visitors will learn about Victorian life and the fascinating history of the estate and its former inhabitants. The Physick Estate was built for a rather unusual household: Dr. Emlen Physick, who never married; his widowed mother, Mrs. Ralston; and his maiden aunt Emilie. Dr. Physick was descended from a famous and wealthy Philadelphia medical family. His grandfather, Dr. Philip Syng Physick, was known as the Father of American Surgery and invented the stomach pump. 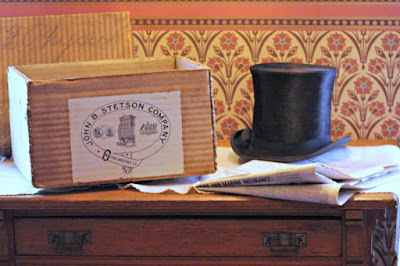 Photo by Susan Krysiak/Courtesy of MAC: Shown here, Dr. Emlen Physick ordered a hat from the John B. Stetson Company, Philadelphia, Pa., which arrived in this very box in the late 1800s. This new house tour theme will be offered through April 2018 (except during the Halloween and Christmas holiday seasons). Guided tours are offered daily through the end of the year; hours vary. Admission is $12 for adults and $8 for children (ages 3-12). Tours can also be combined with trolley tours of Cape May's Historic District, for $22 for adults and $14 for children (ages 3-12). Also available are Physick Estate Children's Tours, especially geared to children ages 5-10, on Mondays, July 3-Aug. 28 at 11:15 am. Admission is $8 per person. The Mid-Atlantic Center for the Arts & Humanities (MAC) is a multifaceted not-for-profit organization committed to promoting the preservation, interpretation, and cultural enrichment of the Cape May region for its residents and visitors. MAC membership is open to all. For information about MAC's year-round schedule of tours, festivals, and special events, call 609-884-5404 or 800-275-4278, or visit MAC's web site www.capemaymac.org. For information about restaurants, accommodations and shopping, call the Chamber of Commerce of Greater Cape May at 609-884-5508 or visit www.capemaychamber.com. For information about historic accommodations, contact Cape May Historic Accommodations at www.capemaylodging.com.